An unaltered photocopy of your DD-214, WD AGO or NGB-22. 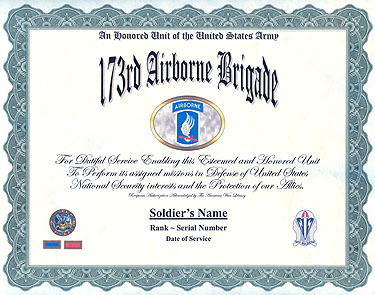 If your service with the 173rd is not displayed on your DD-214 you must provide a copy of your DD-214 -AND- a copy(s) of any military-issued clearly displaying your service with the 173rd Airborne Brigade. The simulated parachute and stylized wings refer to the airborne mission of the Brigade. The unsheathed sword, point to base (implying from sky to ground) and the hilt against the red section of the parachute canopy, alludes to the combat assault jump made by the Brigade in February 1967, the first such jump made by any unit in Vietnam indicated by the "V" formed by the two lightning flashes on the V-shaped silver edged blue area. The single sword also alludes to other Brigade "firsts" such as first American ground unit in Vietnam, first in War Zones C and D and first in the Iron Triangle. The lightning flashes are also symbolic of the Brigade's striking power and surprise and rapidity of movement. The numerical designation of the Brigade can be readily simulated by various combinations of the design elements, i.e., the sword indicating one (1), the sum of the wings, the two lightning flashes and the three sections of the parachute canopy being Seven (7) and the latter by itself also being used for three (3). The distinctive unit insignia was originally approved for the 173d Airborne Brigade on 10 August 1967. The insignia was redesignated for the 173d Airborne Brigade Combat Team with the description updated on 11 October 2006. The 173d Airborne Brigade was constituted 5 August 1917 as an infantry brigade and organized 25 August 1917 at Camp Pike, Arkansas as an element of the 87th Division. The Brigade deployed to France in 1918 as part of the Division, but did not participate in any named campaigns. Returning to the United States the Brigade was demobilized January 1919 at Camp Dix, New Jersey. Reconstituted 24 June 1921 in the Organized Reserves as Headquarters and Headquarters Company, 173d Infantry Brigade, and assigned to the 87th Division at Shreveport, Louisiana. Organized in December 1921 at Mobile, Alabama. Redesignated 23 March 1925 as Headquarters and Headquarters Company, 173d Brigade. Redesignated 24 August 1936 as Headquarters and Headquarters Company 173d Infantry Brigade. Converted and redesignated 13 February 1942 as the 87th Reconnaissance Troop and ordered into active military service 15 December 1942. During World War II, when brigades were eliminated from divisions, Headquarters and Headquarters Company of the 173d Infantry Brigade fought in three European campaigns as the 87th Reconnaissance Troop. After the war, the troop reverted to reserve status and was active from 1947 to 1951 at Birmingham, Alabama. It was inactivated 1 December 1951 at Birmingham, Alabama and released from assignment to the 87th Infantry Division. In 1963 it was allotted to the Regular Army and activated on Okinawa 26 March 1963 as the 173d Airborne Brigade (Sep). Brigadier General Ellis W. Williamson commanded the unit, which was given the charter to serve as the quick reaction force for the Pacific Command. Under Williamson the unit trained extensively making mass parachute jumps and they earned the nickname Tien Bien or Sky Soldiers, from the Nationalist Chinese paratroopers. Deployed to Vietnam in May 1965, the brigade was the first major ground combat unit of the United States Army to serve there. They were the first to go into War Zone D to destroy enemy base camps, introduced the use of small long-range patrols, and conducted the only combat parachute jump in the Vietnam conflict on 22 February 1967 (Operation Junction City). They fought in the Iron Triangle and blocked NVA incursions at Dak To during some of the bloodiest fighting of the war in the summer and fall of 1967, culminating in the capture of Hill 875. Elements of the brigade conducted an amphibious assault against NVA and VC forces as part of an operation to clear the rice-growing lowlands along the Bong Song littoral. The 1st and 2nd Battalions, 503d Infantry were the first Army combat units from the 173d sent to the Republic of South Vietnam, accompanied by the 3rd Battalion, 319th Artillery. They were supported by the 173d Support Battalion, 173d Engineers, Troop E, 17th Cavalry and Co D, 16th Armor. The First Battalion of the Royal Australian Regiment and the 161st Field Battery of the Royal New Zealand Army were later attached to the Brigade during the first year. The troopers of the 173d Airborne Brigade wear their combat badges and decorations with pride. During more than six years of continuous combat, the brigade earned 14 campaign streamers and four unit citations. Sky Soldiers serving in Vietnam received 13 Medals of Honor, 46 Distinguished Service Crosses, 1736 Silver Stars and over 6,000 Purple Hearts. There are over 1,790 Sky Soldiers' names on the Vietnam Memorial Wall in Washington D.C. 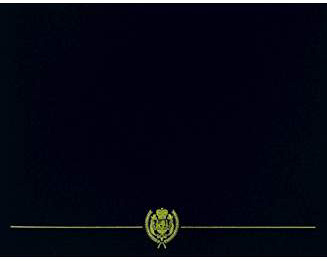 The brigade was deactivated on 14 January 1972 at Fort Campbell, Kentucky. The 173d Airborne Brigade was then reactivated on 12 June 2000 on Caserma Ederle in Vicenza, Italy, where it serves as European Commands only conventional airborne strategic response force for the European Theater. On March 26, 2003, the 173d added to its distinguished history by making the largest mass combat jump since WWII when the brigades Soldiers landed in the Bashur Drop zone effectively opening a northern front in support of Operation Iraqi Freedom. The actions of the brigade caused the Iraqi defenses to commit forces to the area making it safer for swift progress to Baghdad by other U.S. forces. Nine Sky Soldiers made the ultimate sacrifice in support of Operation Iraqi Freedom. In the spring of 2005, the 173d began its second deployment in three years to Afghanistan in support of Operation Enduring Freedom VI. The 1-508th spearheaded the deployment in February by deploying forces along the Afghanistan-Pakistan border in Regional Command East. The remainder of the brigade deployed to Regional Command South, with all elements of the brigade demonstrating unparalleled bravery fighting anti-coalition forces in the bloodiest spring since original invasion in 2001. The brigade excelled in all aspects of the deployment to include facilitating a peaceful parliamentary election process in the fall of 2005. 17 Sky Soldiers made the ultimate sacrifice in support of operation Enduring Freedom VI. Today's Sky Soldiers continue the distinction of honored service earned through service dating back to World War I, and proudly represent the airborne fighting spirit with routine training deployments to Bosnia, Kosovo, Hungary, Tunisia, Morocco, Germany, Italy, Czech Republic, and more. These deployments are an important part of CINCEURS theater engagement strategy, demonstrating both a commitment to preserving stability in Europe and the ability to provide immediate response to crisis situations throughout the theater.